Webseology / SEO Tips / Relevant Content is Not Enough! Relevant Content is Not Enough! No amount of search engine optimization can make up for the lack of relevant content or poor on-site navigation. It is not surprising that today’s SEO analyst must also have the skills to write compelling relevant copy so that readers and site visitors keep coming to the website even after they find it on their Search Engine Result Pages. Relevant content refers to information that is locally (geographically) relevant and whose keywords point to exactly what the user is looking for when they search for similar content online. There is no need for you to create content and tag it with keywords that don’t mean or point to exactly what your reader is looking for. I’ll get to some tips below that you can use to ensure that your website carries highly relevant content and proper navigational flow that the user finds easy to work with. Ok, so great, you got the great content that the search engines love and your readers want to know about, but how do you keep them sticking around or better yet, coming back for more? It takes more than just relevant content to accomplish this mission. It also takes easy to understand site navigation that makes sense to the site visitors. Certain types of websites have navigation that does little to enhance user experience. Leaving readers lost and confused, hitting the back button frantically. Locate your navigation under your header as a left vertical column or a top horizontal row just under the header/logo. If you take an example of an eCommerce website, this is the practice employed to ensure deep sub categories are navigated through seamlessly. It is also imperative to keep your navigational menu consistent throughout the entire website. Reduce the work needed by your clients through clicking by introducing drop down menus. This should quickly show the user the kind of depth of your categories offer at a sweeping glance. The next thing to consider and tweak is the number of elements in your navigation. It is important not to overwhelm your uses with too many categories to choose from. Ensure that your users have access to a maximum of seven options. Another important practice is to highlight the position where your user is in the maze of content you have provided. This is important especially as the user navigates deeper into your website and may quickly want to retrace their steps back to the real reason they visited. Also, visitors can arrive on a page deep in your website from a search engine. It is important that they find their way quickly and get the information they came for. On many websites, this is carried out by applying a different color to the link that points to the current location of the browser on your site indicating where the user is. The recipe goes as follows: Mix evenly together user-experience and creative design with a heavy dose of great, relevant content and equal portions of user-friendly navigational flow. 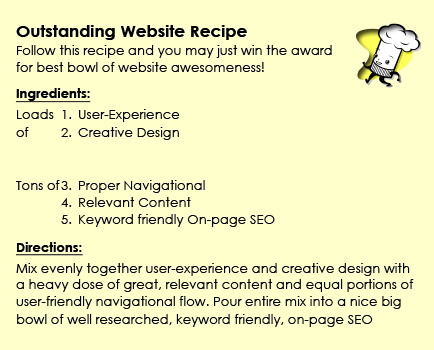 Pour entire mix into a nice big bowl of well researched, keyword friendly, on-page SEO and you may just win the award for best bowl of website awesomeness! WebSEOlogy is a Scottsdale, AZ based digital marketing firm that specializes in creative, affordable web design, search engine optimization (SEO), branding, logo design, and social media marketing for small businesses. It is our goal to build a real online presence for our customers.